The mirror self-recognition (MSR) test is commonly used to evaluate nonhuman animals’ self-awareness, and has been reportedly passed by several mammals and birds including apes, elephants, dolphins, and magpies. According to a study published earlier this month (March 11) in The Journal of Ethology, there’s now evidence to add manta rays to that list. Contingency checking and self-directed behaviors in giant manta rays: Do elasmobranchs have self-awareness? Elaborate cognitive skills arose independently in different taxonomic groups. Self-recognition is conventionally identified by the understanding that one’s own mirror reflection does not represent another individual but oneself, which has never been proven in any elasmobranch species to date. Manta rays have a high encephalization quotient, similar to those species that have passed the mirror self-recognition test, and possess the largest brain of all fish species. In this study, mirror exposure experiments were conducted on two captive giant manta rays to document their response to their mirror image. The manta rays did not show signs of social interaction with their mirror image. However, frequent unusual and repetitive movements in front of the mirror suggested contingency checking; in addition, unusual self-directed behaviors could be identified when the manta rays were exposed to the mirror. The present study shows evidence for behavioral responses to a mirror that are prerequisite of self-awareness and which has been used to confirm self-recognition in apes. 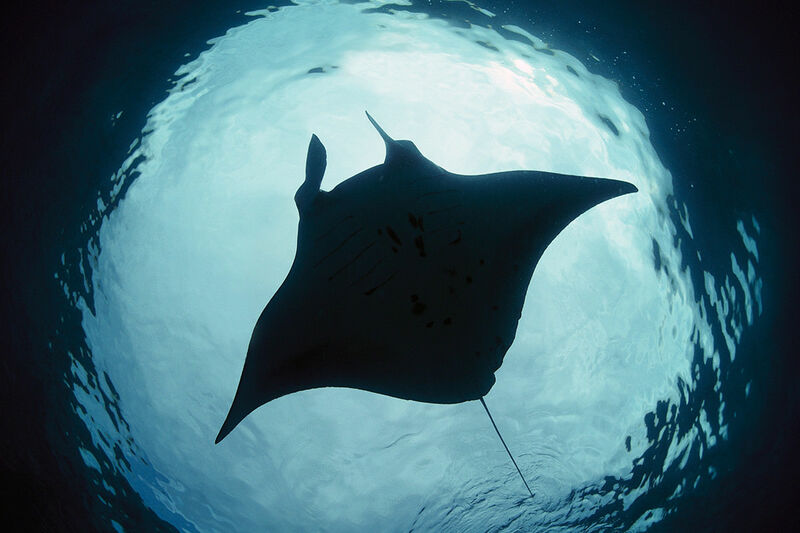 X-RAY MAG: How did you become interested in studying the behavior of manta rays? CA: I knew that I wanted to dedicate my life to study and protect marine life since I was 13 years old. It was during a family vacation in Croatia when I first had the chance to try scuba diving. I was so mesmerized by the experience that when I surfaced I decided to try to find out more about this magical world. I became especially fascinated by the majestic and mysterious manta rays after watching a nature documentary, soon after this first dive. It described how little we know about them and how vulnerable they are. But growing up in Hungary, a landlocked country, I did not have much option to pursue my dream as a marine biologist, so I got my master’s degree in zoology and my doctorate in neurobiology, while volunteering at oceanography institutes in different countries during the summers. During my PhD studies, I worked on the neuroanatomy and neurohistology of several shark and ray species, including mobulids (mantas and mobulas). During these years, I had the chance to explore the brain structures of mantas and mobulas, which reflected some very unique and surprising features. It was the unusual enlargement of some of their brain parts that got me interested in focusing on their behavior. “Manta rays are likely the first fish species found to exhibit self-awareness, which implies higher order brain function, as well as sophisticated cognitive and social skills,” study coauthor Csilla Ari told X-Ray Mag. X-RAY MAG: What were the findings that caused you to conclude that these animals are using cognition? CA: Animal cognition, often referred to as animal intelligence, is an exciting scientific field that attempts to describe the mental capacity of an animal. It developed from the field of comparative psychology and it includes exciting research questions, such as perception, attention, selective learning, memory, spatial cognition, tool use, problem solving or consciousness. There are no easy ways to test these on manta rays, but I found a widely-used and well-established test that can give us insight on their cognitive abilities. The mirror self-recognition (MSR) test is considered to be a reliable behavioral index to show the animal’s ability for self-recognition/self-awareness. Recognizing oneself in a mirror is a very rare capacity among animals. Only a few, large-brained species have passed this test so far, including Asian elephants, bottlenose dolphins and great apes, but no fish species so far. So, employing a protocol adapted from primates and bottlenose dolphin MSR studies, I exposed captive manta rays to a large mirror and recorded their behavior. The manta rays showed significantly higher frequency of repetitive behavior, such as circling at the mirror or high frequency cephalic fin movements when the mirror was placed in the tank. Contingency checking and self-directed behavior included body turns into a vertical direction, exposing the ventral side of the body to the mirror while staying visually oriented to the mirror. Most surprisingly, such self-directed behaviors were sometimes accompanied with bubble blowing front of the mirror and sharp downward swims. But the MSR test’s developer, Gordon Gallup of the State University of New York at Albany, told New Scientist that the observed movements might reflect curious, rather than self-aware, behavior. “Humans, chimpanzees, and orangutans are the only species for which there is compelling, reproducible evidence for mirror self-recognition,” he said. 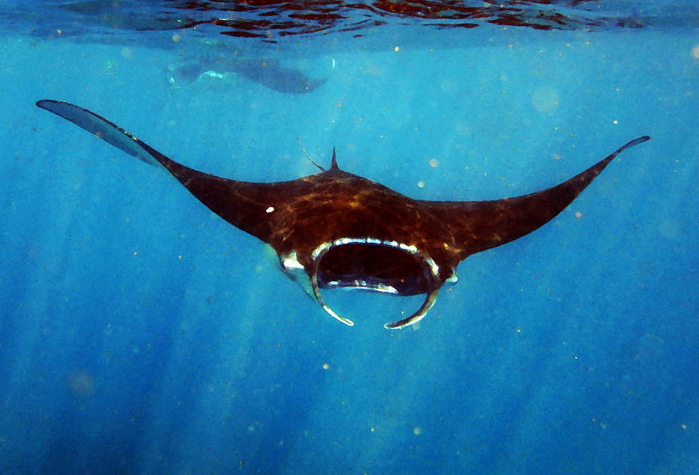 Giant manta rays have been filmed checking out their reflections in a way that suggests they are self-aware. Rattlesnakes and other vipers are well-known for their lightning-quick bites, but nonvenomous snakes may be just as speedy, according to a study published this month (March 15) in Biology Letters. To survive, organisms must avoid predation and acquire nutrients and energy. Sensory systems must correctly differentiate between potential predators and prey, and elicit behaviours that adjust distances accordingly. For snakes, strikes can serve both purposes. Vipers are thought to have the fastest strikes among snakes. However, strike performance has been measured in very few species, especially non-vipers. We measured defensive strike performance in harmless Texas ratsnakes and two species of vipers, western cottonmouths and western diamond-backed rattlesnakes, using high-speed video recordings. We show that ratsnake strike performance matches or exceeds that of vipers. In contrast with the literature over the past century, vipers do not represent the pinnacle of strike performance in snakes. Both harmless and venomous snakes can strike with very high accelerations that have two key consequences: the accelerations exceed values that can cause loss of consciousness in other animals, such as the accelerations experienced by jet pilots during extreme manoeuvres, and they make the strikes faster than the sensory and motor responses of mammalian prey and predators. Both harmless and venomous snakes can strike faster than the blink of an eye and often reach a target before it can move. To put the assumption to the test, Penning and his colleagues used a high-speed camera to film strikes from three snake species—the western cottonmouth and the western diamond-backed rattlesnake (both vipers), and a relatively harmless Texas rat snake that kills its prey using constriction. When Penning and his colleagues compared strike speeds in three types of snakes, they found that at least one nonvenomous species was just as quick as the vipers. The results hint that serpents’ need for speed may be much more widespread than thought, which raises questions about snake evolution and physiology. They compared the western cottonmouth and the western diamond-backed rattlesnake, which are both vipers, and the nonvenomous Texas rat snake. They put each snake inside a container and inserted a stuffed glove on the end of a stick. They waved the glove around until the animal struck, recording the whole thing with a high-speed camera. The team tested 14 rat snakes, 6 cottonmouths and 12 rattlesnakes, recording several strikes for each individual. The recordings revealed that although the highest head acceleration—279 meters per second squared, or nearly 29 g—did indeed come from a rattlesnake, one of the rat snakes followed close behind, accelerating its head at 274 meters per second squared. All the snakes turned out to be speed demons, the team reports this week in Biology Letters. The rattlesnake scored the highest measured acceleration, at 279 meters per second squared. But to their surprise, the nonvenomous rat snake came in a close second at 274 meters per second squared. That’s lightning-quick, considering that a Formula One race car accelerates at less than 27 meters per second squared to go from 0 to 60 in just one second. Penning told Discover Magazine that the results make sense, since even nonvenomous snakes have to catch their food. “Prey are not passively waiting to be eaten by snakes,” he said. Rather than offering the snakes some sacrificial prey animals, the researchers baited the snakes into striking in self-defense. They used a stuffed glove on a stick. The glove would move around the snake until the animal realized the glove was “clearly not going away,” Penning says, and struck at it. High-speed cameras and mirrors captured these attacks, which happened in the blink of an eye. Emerging evidence suggests that both humans and superb fairywrens begin learning the vocal patterns of their mothers even before birth. Now, a study published this month (March 16) in The Auk: Ornithological Advances indicates that the same is true of the red-backed fairywren, offering the possibility of studying the phenomenon across related species. “Fairywrens have become a new model system in which to test new dimensions in the ontogeny of parent-offspring communication in vertebrates,” study coauthor Mark Hauber of New York City’s Hunter College said in a statement. Diane Colombelli-Négrel, Michael S. Webster, Jenélle L. Dowling, Mark E. Hauber, andSonia Kleindorfer (2016) Vocal imitation of mother’s calls by begging Red-backed Fairywren nestlings increases parental provisioning. The Auk: April 2016, Vol. 133, No. 2, pp. 273-285. White storks may be addicted to junk food, in some cases making migratory trips of tens of kilometers to landfill sites during the breeding season, according to a study published earlier this month (March 15) in Movement Ecology. The migratory patterns of animals are changing in response to global environmental change with many species forming resident populations in areas where they were once migratory. The white stork (Ciconia ciconia) was wholly migratory in Europe but recently guaranteed, year-round food from landfill sites has facilitated the establishment of resident populations in Iberia. In this study 17 resident white storks were fitted with GPS/GSM data loggers (including accelerometer) and tracked for 9.1 ± 3.7 months to quantify the extent and consistency of landfill attendance by individuals during the non-breeding and breeding seasons and to assess the influence of landfill use on daily distances travelled, percentage of GPS fixes spent foraging and non-landfill foraging ranges. Results Resident white storks used landfill more during non-breeding (20.1 % ± 2.3 of foraging GPS fixes) than during breeding (14.9 % ± 2.2). Landfill attendance declined with increasing distance between nest and landfill in both seasons. During non-breeding a large percentage of GPS fixes occurred on the nest throughout the day (27 % ± 3.0 of fixes) in the majority of tagged storks. This study provides first confirmation of year-round nest use by resident white storks. The percentage of GPS fixes on the nest was not influenced by the distance between nest and the landfill site. Storks travelled up to 48.2 km to visit landfills during non-breeding and a maximum of 28.1 km during breeding, notably further than previous estimates. Storks nesting close to landfill sites used landfill more and had smaller foraging ranges in non-landfill habitat indicating higher reliance on landfill. The majority of non-landfill foraging occurred around the nest and long distance trips were made specifically to visit landfill. Conclusions The continuous availability of food resources on landfill has facilitated year-round nest use in white storks and is influencing their home ranges and movement behaviour. White storks rely on landfill sites for foraging especially during the non-breeding season when other food resources are scarcer and this artificial food supplementation probably facilitated the establishment of resident populations. The closure of landfills, as required by EU Landfill Directives, will likely cause dramatic impacts on white stork populations. You’ve heard of the staycation. Some white storks in Europe are now opting for the staygration. The big birds are skipping their annual trip to African wintering grounds to remain year-round in Spain and Portugal, a new study shows. Why? They’ve developed an addiction to junk food at landfills. “White storks used to be wholly migratory. Before the 1980s, there were no white storks staying in” Spain and Portugal, says study leader Aldina Franco, a conservation ecologist at the University of East Anglia in the U.K.
Israel’s barren Negev desert is home to striped hyenas and gray wolves—two large scavenger species with considerably overlapping diets. But although such conditions might be expected to create fierce competition, researchers in Israel and the U.S. have now presented evidence that—at least in some cases—these animals form alliances and may even hunt collaboratively for food. The findings were published last month (February 10) in Zoology in the Middle East. Wolves and hyenas in the desert might “just need each other to survive, because food is so, so limited,” study coauthor Vladimir Dinets of the University of Tennessee in Knoxville told The Washington Post. Collating observations made over the past two decades (including reports of overlapping paw prints, and sightings of hyenas among packs of wolves), the researchers note that the findings could reflect the behavior of a few, oddly behaving hyenas, or a more widespread commensal, or even cooperative, relationship between the species.